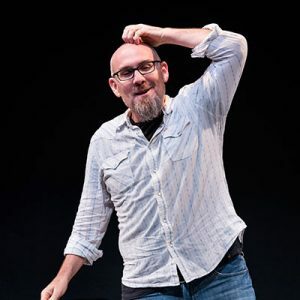 Seeking a vibrant creative outlet, Dan O’Neil discovered the glory of long-form improv at WIT in 2007. Improv has continued to feed his soul ever since. Dan’s played with various long-form ensembles, most notably Madeline, The Lodge, microCOSM, Ouroboros, Bloodlust, Crude Mechanicals, and Yojimprov. He has performed at UCB’s Del Close Marathon, as well as the Baltimore and Richmond Improv Festivals. Dan has also studied improvisation, acting and movement at Studio Theatre, The Centre for Movement Theatre and Joy of Motion. Although he’s been camping fewer than ten times in his life, Dan kinda believes he could survive 21 days on Naked & Afraid. After all, he’s an improviser, right? The magic is in the process, the becoming, the present moment. Dan’s played with various long-form ensembles, most notably The Lodge, microCOSM, Ouroboros, Bloodlust, Crude Mechanicals, and Yojimprov. He has performed at UCB’s Del Close Marathon, as well as the Baltimore and Richmond Improv Festivals. Dan has also studied improvisation, acting and movement at Studio Theatre, The Centre for Movement Theatre and Joy of Motion. Although provocative, Dan still argues that Jason Momoa’s portrayal of Conan the Barbarian is to superior to Arnold’s. Despite years of waiting, he is still not bitter that Jamie Lee Curtis has yet to respond to the letter he sent her when he was a high school freshman.